This page is now out of date, an updated version is available here. So I decided to start over and try Homebrew. Homebrew is a package manager for Mac OSX that installs packages in it’s own directory then symlinks the files to /usr/local. The reason I went with Homebrew rather than MacPorts is that I found on occasions MacPorts overwrote existing files. Homebrew instead warns you of any clashes and allows you to decide which version to keep. If you need to remove MacPorts there is a detailed guide. You may also need to update your BASH profile. Most of these are from my previous installation of OpenBabel and needed to be deleted. Don’t worry if you forget to delete a file, when you come to the brew install of that package it will first check and warn you of any files should be removed. The way Homebrew works is it installs everything to /usr/local/Cellar, then creates aliases in /usr/local/bin and /usr/local/lib so they are on your $PATH. You will likely have stuff manually installed in these directories - this is fine, but if they are things that can be installed using homebrew it's best to delete them and then reinstall using homebrew. which should be an alias to "/usr/local/Cellar/gcc/4.8.3/bin/gfortran". There is already an (outdated) open-babel formula in the main homebrew repository, so use the full path, the "mcs07/cheminformatics" part is required because of the old outdated open-babel formula in the main homebrew repository which clashes. The "--HEAD" part means install the latest development version from GitHub. This isn't ideal, but the latest version available as an installer is the 2.3.1 version is so outdated now that there are problems compiling it on Mavericks. The "--HEAD" part means install the latest development version from GitHub. The latest version of OpenBabel is now available so can be installed directly. chemspot is ChemSpot is a set of tools for named entity recognition and classification of chemicals in natural language texts, including trivial names, abbreviations, molecular formulas and IUPAC entities. inch InChi is a non-proprietary, international standard to represent chemical structures. opsin Opsin is an Open Parser for Systematic IUPAC nomenclature. osra Osra Optical Structure Recognition Application is a utility designed to convert graphical representations of chemical structures and reactions, as they appear in journal articles, patent documents, textbooks, trade magazines etc., into SMILES or MOL files. Align-it™ is a pharmacophore-based tool to align molecules by representing pharmacophoric features as Gaussian 3D volumes. Shape-it™ is a shape-based alignment tool that represents molecules as a set of atomic Gaussians. The software is based on the alignment method described by Grant and Pickup (J. Phys. Chem. 1995, 99, 3503). This installation switches the stereo/mono graphics paradigm. Recent builds of OSX with intel chips seem to crash with stereo graphics. Therefore, Homebrew-installed pymol defaults to assuming the "-M" flag has been passed to it. You can switch to stereo graphics with the "-S" flag when you start PYMOL. You will also need a number of python bindings to access the toolkits from python scripts, to do this we use PIP a tool for installing and managing Python packages. And then everything is up to date. InChI ver 1, Software version 1.04 (Library call example; classic interface) Build of September 9, 2011. 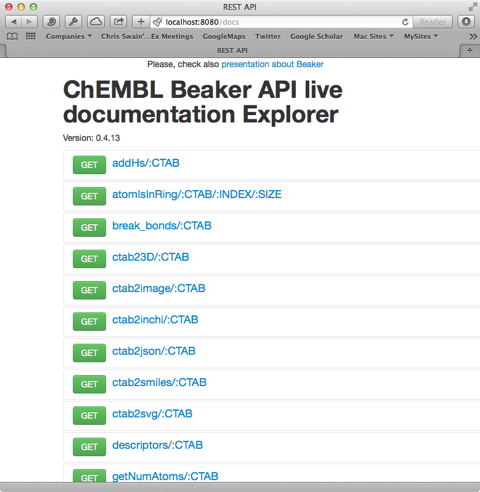 To test chemspot in the Terminal type (change username to your name), beware chemspot is pretty resource hungry. To test OSRA you will need an image of chemical structure, you can drag the image below to your desktop. For some reason screenshots don’t work at present, a workaround is to open the screenshot image in Preview and save it as a jpeg file. ChEMBL standardisation process, consisting of neutralisation, bond breaking, salt removal and applying various rules. If you select smiles23D/:CTAB and type in a SMILES string and click on the green “GET” button you should see the following response. ffnet (0.7.1+), only for neural network functionality. Installation of the toolkits using Homebrew is described above. The publication also includes a series of iPython notebooks to get you started. When El Capitan first came out I upgraded a machine with an existing installation of a variety of cheminformatics tools installed using Homebrew and PIP as described aboveUnder this situation Pymol worked without problem. However I have had a few readers email me saying they are having problems with Pymol so I took a new machine running El Capitan and tried to install the same cheminformatics tools including Pymol using Homebrew and PIP. All worked fine except Pymol which opened but crashed with the following error. Created by Warren L. DeLano, Ph.D.
are freely available, PyMOL is not in the public domain. software by purchasing a PyMOL Maintenance and/or Support subscription. 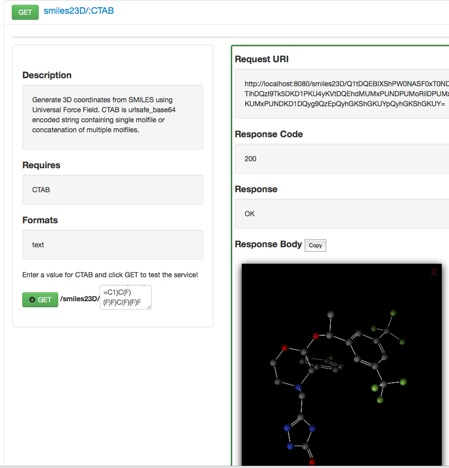 More information can be found at "http://www.pymol.org". Enter "help" for a list of commands. Enter "help <command-name>" for information on a specific command. Hit ESC anytime to toggle between text and graphics. Detected OpenGL version 2.0 or greater. Shaders available. Detected 2 CPU cores. Enabled multithreaded rendering. If you now type Pymol in a Terminal window it should start fine.